After spending so long defending the potential of live action Disney remakes, I can’t deny that coming across the absolute nadir of the concept’s merit is a particularly satisfying experience. Yet, that’s exactly what “Dumbo” manages to be for the entire concept of these live action remakes. Fittingly directed by Tim Burton, whose “Through the Looking Glass” styled remake of Disney’s “Alice in Wonderland” kicked off the entire concept over nine years ago, the movie does forgo the lazier and more cynical approach of retelling the narrative of its 1941 animated source material beat for beat. 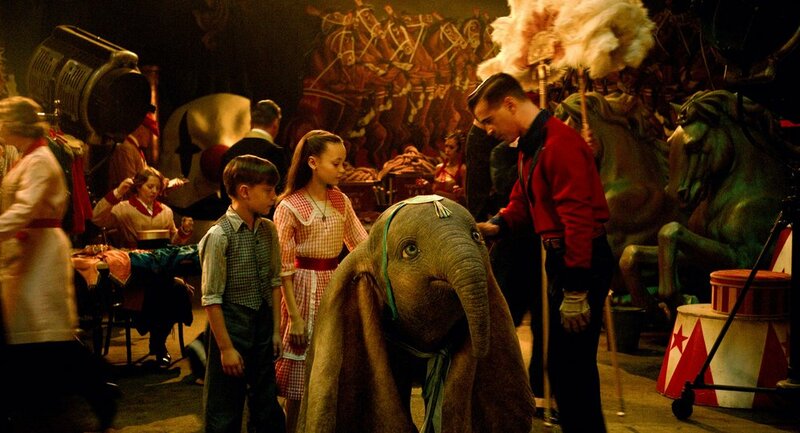 Using the conventional tools of live action to convey its story, “Dumbo” shifts the focus away from the titular elephant in favor of the circus community that raised him and the trials and tribulations they undergo struggling to turn a profit in a tumultuous entertainment industry. Specifically a recently widowed stunt-horse rider (Colin Farrell), and his two children, alongside a shrewd but lovable ringmaster (Danny DeVito) try to find and manage an act to make him feel at home with the sale of his mother having recently finalized. The nicest thing I can say about “Dumbo” is that it didn’t fail to take the benefits of its chosen and forsaken mediums for granted. The original movie is a quaint, charming, and emotional, fable of a movie that fully embraced the medium of animation as a tool to characterize a cast of predominantly nonhuman characters who served as the central focus of the story. Translating it directly to live action wasn’t going to replicate even a fraction of the charm in that original story and this adaptation fortunately doesn’t try to, instead aiming to put its own spin on the premise by telling its own unique interpretation of the story buoyed by impressive performances by DeVito, Farrell, Eva Green, and an undeniably gorgeous art direction instilling a sense of imagination in ways Tim Burton can probably put together in his sleep. Unfortunately, that’s about where the good ends. 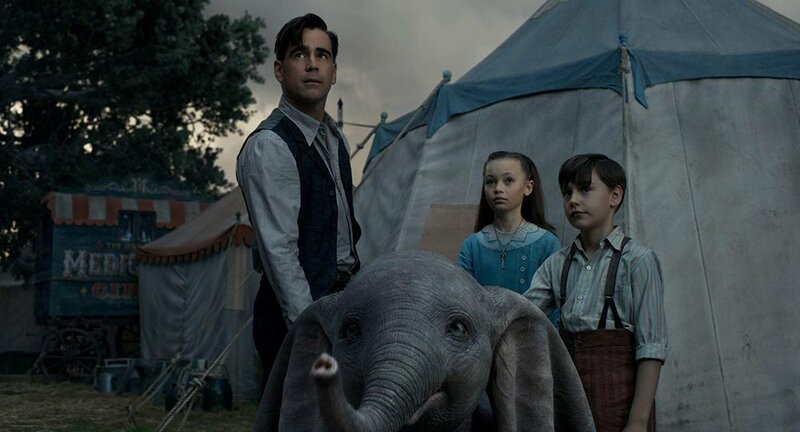 Despite no longer being the focus of his own movie, Dumbo himself is still an adorable creature at the center of what heart this film has to give. By virtue of the movie’s approach however, driven by the human drama, he isn’t effectively utilized enough. Scenes like his emotional goodbye to his mother and learning to fly are a drop in the bucket compared to the focus placed on the new subjects of this film’s chosen creative direction and that is sadly where “Dumbo” completely falls apart. 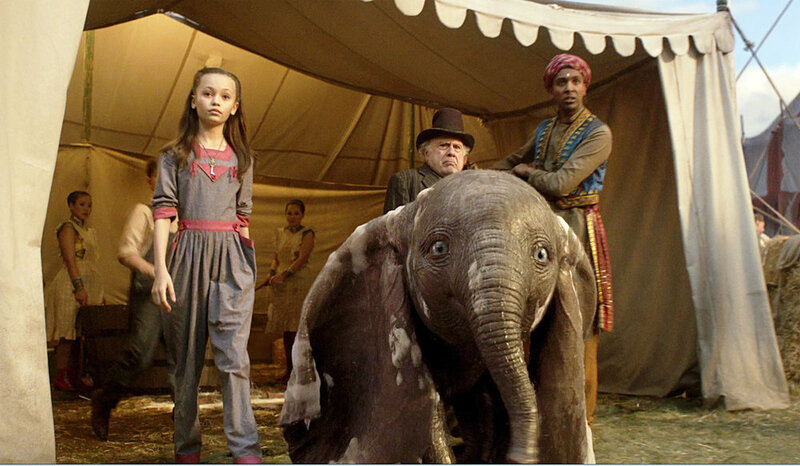 Everything involving the human cast of “Dumbo” is a hodgepodge of circus movie, kid and their animal, show business drama, coming of age, period piece clichés long past their prime and executed in a capacity that’s either so bland it’s outright dull, borderline infuriating in how obviously it missed an opportunity to do more and be more if it put in the slightest bit of effort, or just laughably terrible. The notion of extensively using a circus setting would be to presumably push the theme of found family that could provide the ostracized young Dumbo comfort, but this never factors into anything that happens in the movie; Dumbo may be a catalyst for things that happen to them but it never directly relates back to him or his desire to reunite with his mother, instead playing second fiddle to two child actors, one of which feels aimless and the other distractingly dead and wooden in her line delivery. The laziness on display in failing to correlate any of these threads efficiently is staggering. Poor Michael Keaton comes out of the entire endeavor worse for wear than the rest of the cast, feeling almost like a caricature of a diabolical Tim Burton mastermind that feels jaw droppingly out of place in a world that’s already heavily stylized. This disconnected cluster of narrative junk plods along until a formulaic uncharacteristically action packed third act climax hits and the subtle realization of just how narratively uninvolving all of this feels and how the over-the-top chaos that ensues feels less like watching a movie and more like watching a really bad Rube Goldberg machine in motion. Despite my protests, “Dumbo” isn’t a terrible movie. For a weekend out with the family, it’s not an unsafe bet to get the job done and it does have occasional moments of visually creative brilliance that stand well on their own and pay clever homage to the original film, despite the soullessness of a screenplay they’re bound to. It is, however, the antithesis of what Disney should want these live action remakes to be; failing to fluff up a traditional approach with infectious levels of pageantry a la “Beauty and the Beast. The movie couldn’t swing for the fences with its new ideas and fail trying something memorable, opting instead to be the most forgettable interpretation of an idea that was already lacking in creativity.